Aimed at those wishing to play 'Non-FX' modern adventures, this book is intended for players and will contain character creation and other useful information for non-magic/psionic campaigns in the contemporary world. 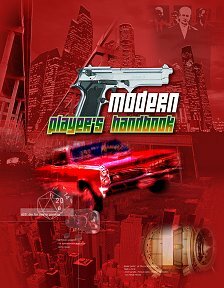 Publisher's blurb: "The Modern Player’s Handbook is RPGObject’s definitive player guide to modern role-playing. This book serves to provide modern gamers with a comprehensive handbook to creating non-FX modern characters and is an alternative core rulebook for modern based products."